Home / Articles / Oh, What Fun! 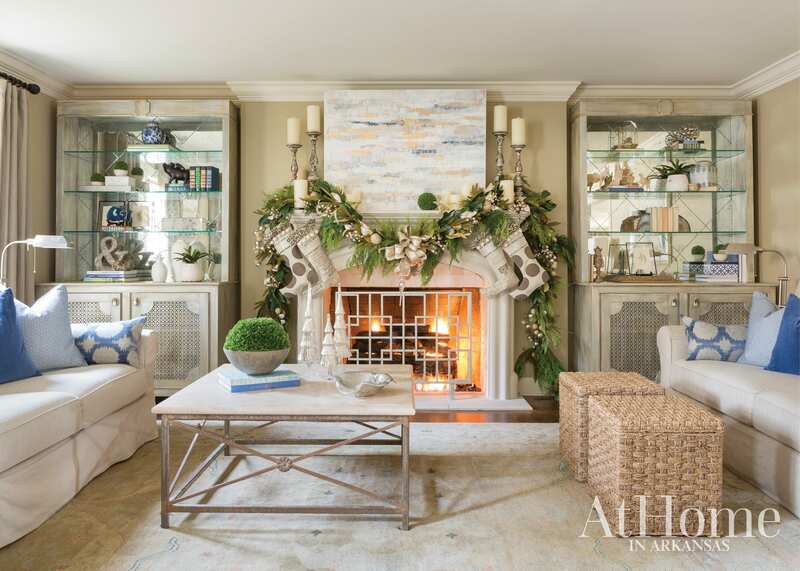 It wasn’t a chance meeting that brought Kirstin and Glen Johnson together, but rather the help of two close friends—Whitney Lammers and interior designer Beth Davis. “I was a sales rep for Delta faucets at the time and had been trying to call on Beth in Searcy for a while. I was able to meet with her, and almost immediately she asked if I was single,” Whitney recalls. “After a conversation we had, I had been trying to set my friend Glen up with someone,” Beth notes. “Whitney just had such a precious demeanor about her that I knew if she wasn’t single, she must have a friend.” As luck would have it, Whitney did have a friend—Kirstin. She and Glen are now married with three children. 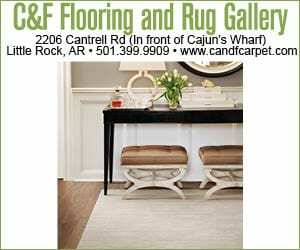 Similarly, when the couple moved from Searcy to Little Rock, they had a little help with their home décor. 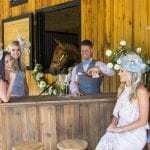 The two women who were instrumental in their meeting, along with another of Kirstin’s dear friends, Katie Henry of Katie Grace Designs, helped to make their house a home. Here’s how the designing trio brought everyday style and holiday cheer to this young family’s space. The outdoor fireplace offers more than just warmth; it’s a perfect spot to roast s’mores on a crisp afternoon. The Johnsons keep the essentials on hand—along with sticks for roasting—in case friends pop by for a treat. 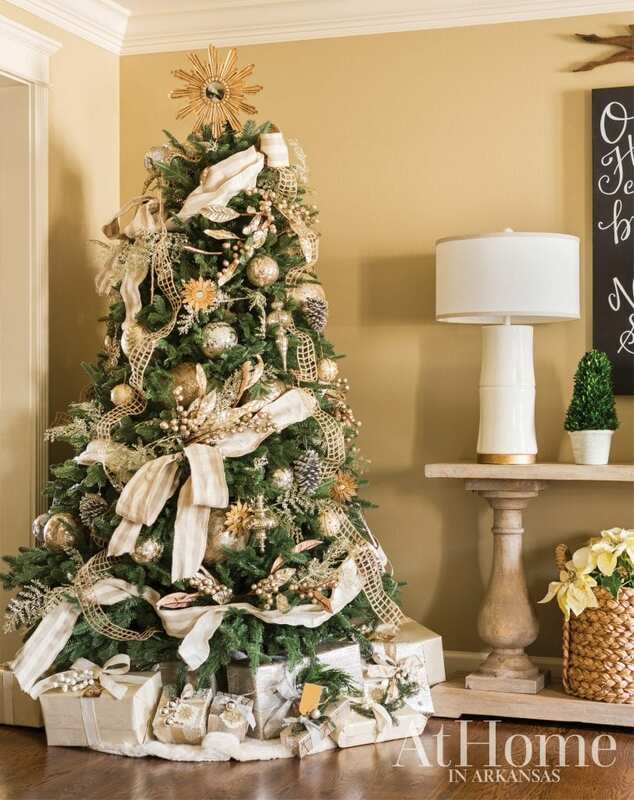 The tree in the living room is adorned with ornaments in glimmering shades of silver, gold, and a range of light creams. 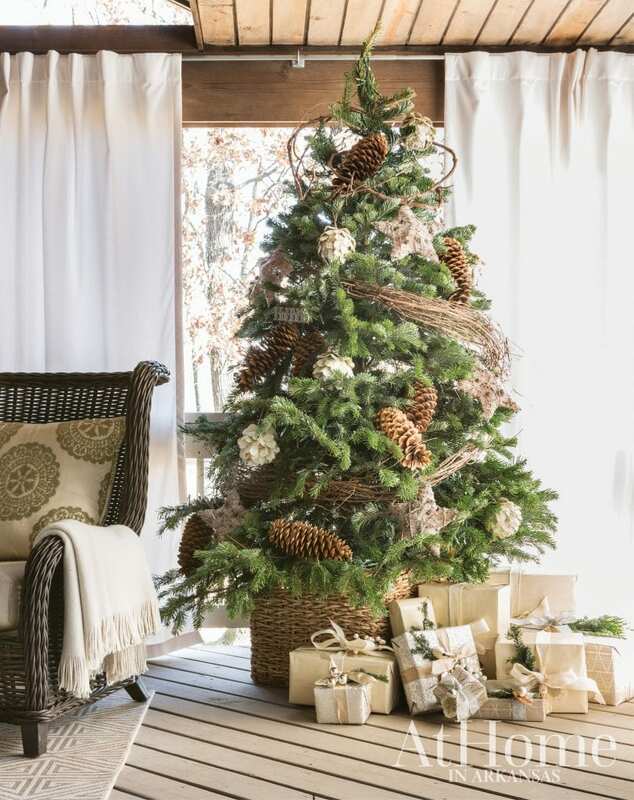 Whitney added a fur tree skirt to coordinate with the elegant elements, which include packages wrapped in the same palette. With three children, one can imagine that the Johnsons’ living room is a bustle of activity on Christmas morning. It is decorated in the same serene hues seen throughout the interior and accented with whimsical stockings for Santa to fill. “My husband is constantly on the go, so we look forward to staying at home on Christmas morning, playing with our kids, and really soaking in that time together,” Kirstin says. Beth had the standalone cabinets (seen on either side of the fireplace) custom made for the family. 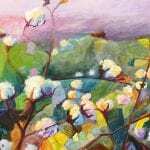 A work by Little Rock artist Amanda Kella (who is Whitney’s sister) rests on the mantel. 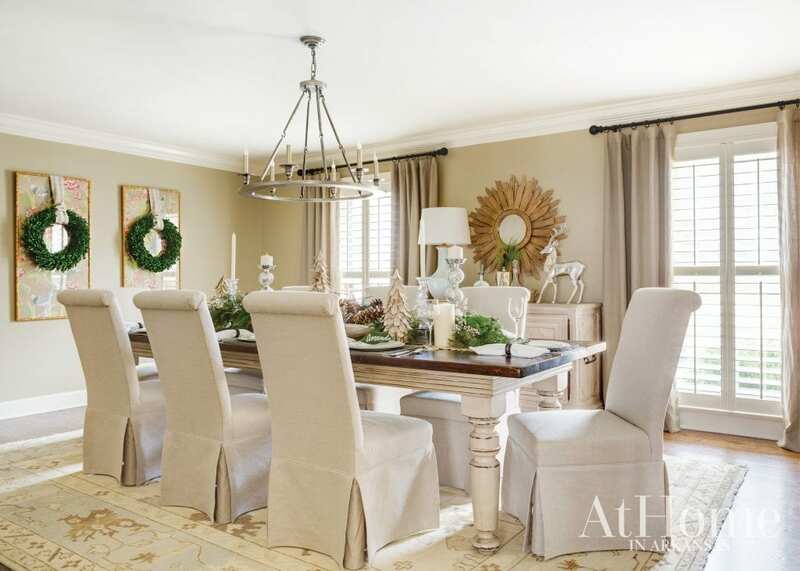 Katie helped the couple find complementary furnishings to pair with the dining table they already owned, while Beth selected the drapery fabric and sourced artwork and accessories. “Kirstin and I originally wanted to wallpaper the entire room in this Thibaut wallpaper that I found; however, Glen thought that might be over-the-top, so we instead decided to frame a couple of pieces and hang them as art,” Beth says of the colorful installation at the far end of the room. 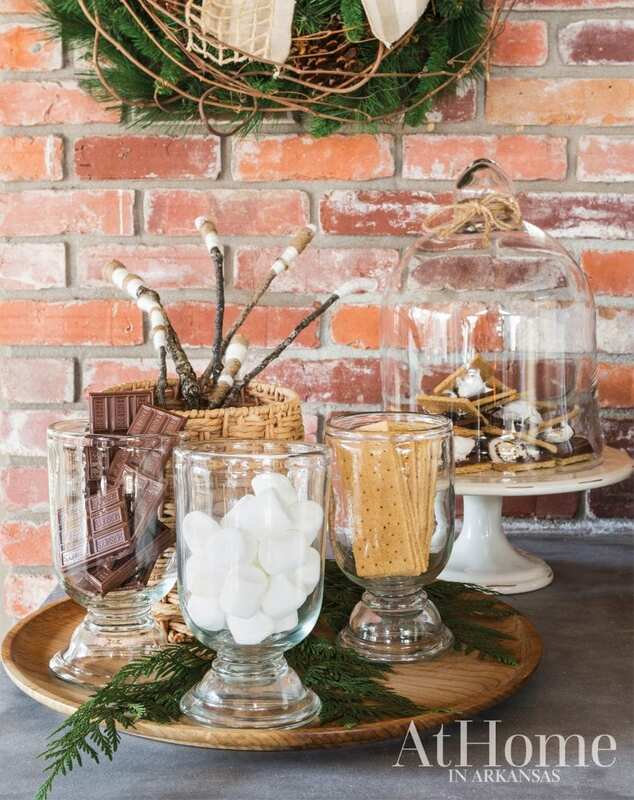 More pieces from Kirstin’s mercury glass holiday collection add polish to the seasonal décor. 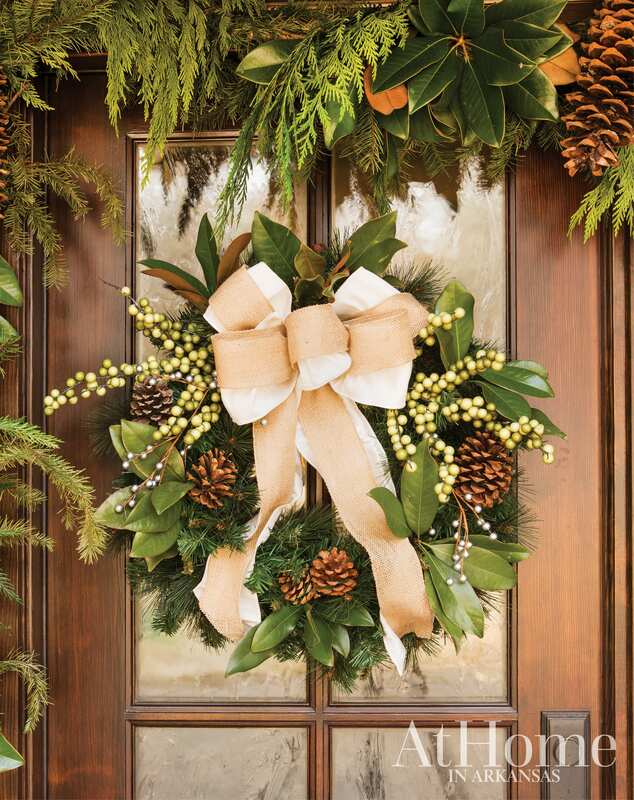 The Johnsons also enjoy hosting their extended family for holiday gatherings. 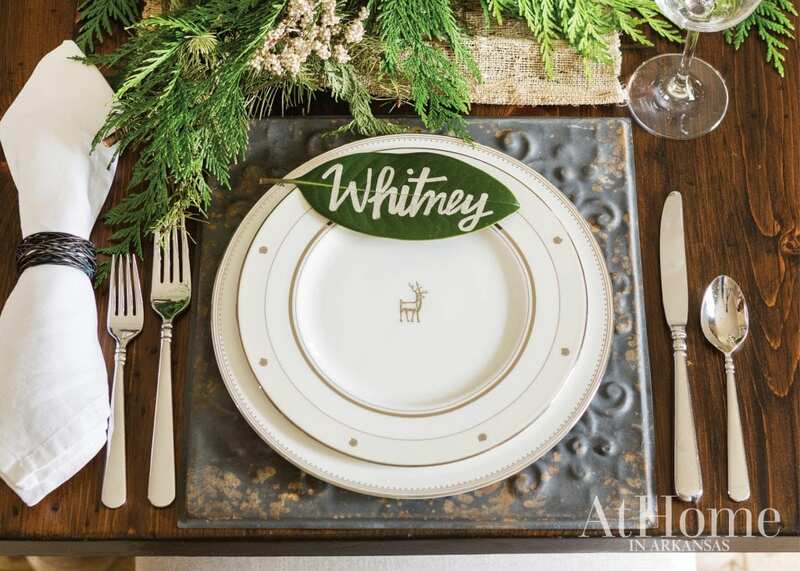 Here, Whitney created place settings that subtly convey the spirit of the season. Magnolia leaves, clipped from the front yard’s tree, serve as place cards for each guest. 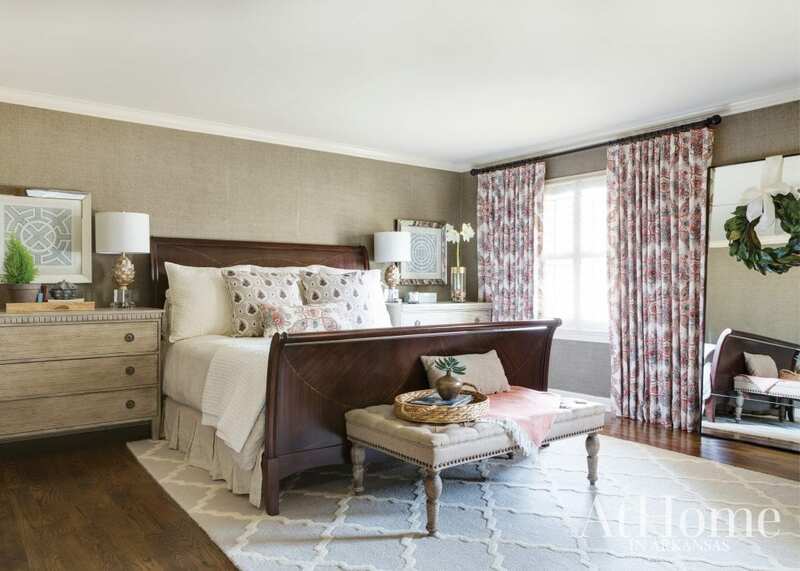 A restful master bedroom was a must for the Johnsons. 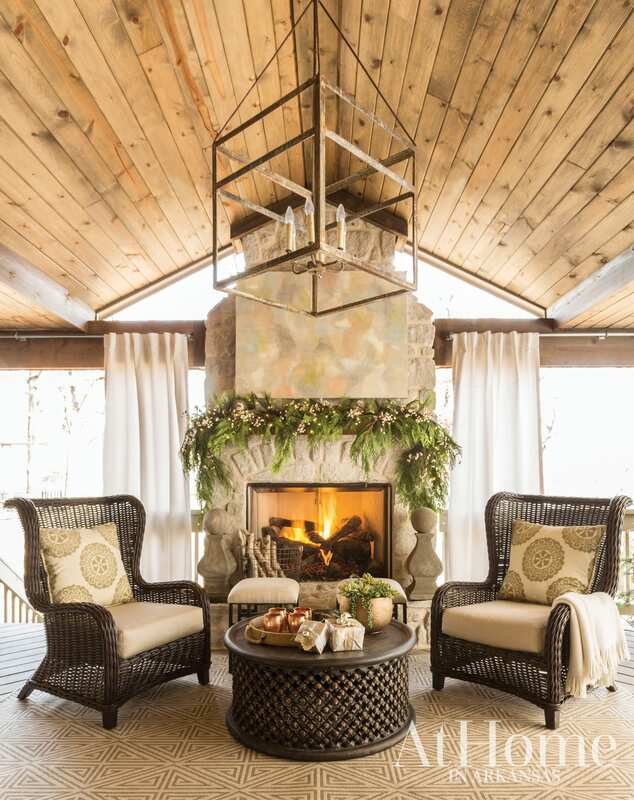 “I added softness to the space with draperies, which are a Tilton Fenwick for Duralee pattern, but didn’t go overboard on accessories,” Beth says. 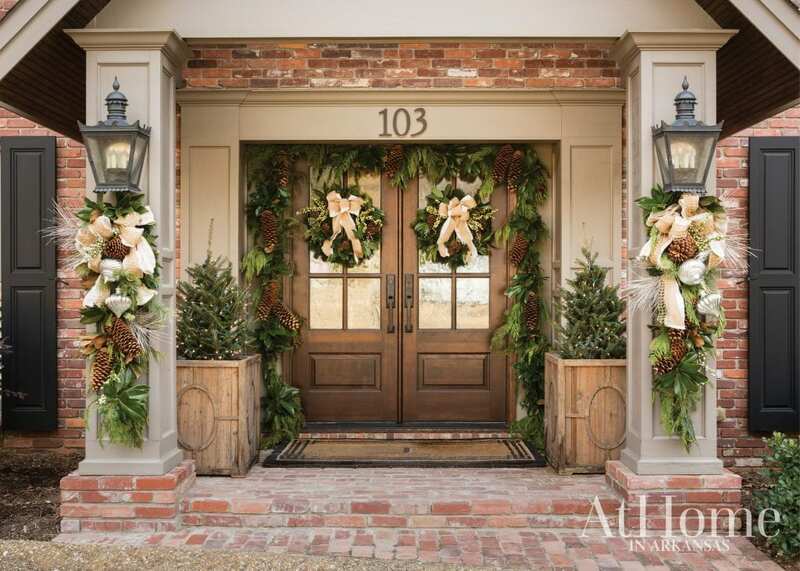 Whitney added a light layer of Christmas décor, including a magnolia wreath, to carry holiday cheer throughout the home.